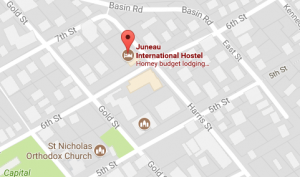 Visitors will find the Juneau Hostel in downtown Juneau, at 6th and Harris Streets. The hostel offers a low cost alternative to the standard but costly hotel stay. The hostel enjoys a convenient location for the weekend explorer. Simply walk up the hill from downtown until you reach 6th Street and turn right. For shopping, restaurants and bars, head downhill to downtown Juneau. Head uphill to Basin Road to the trail heads for the Flume Trail, Perseverance Trail, Mt. Roberts Trail, as well as the Mt. Juneau Trail. 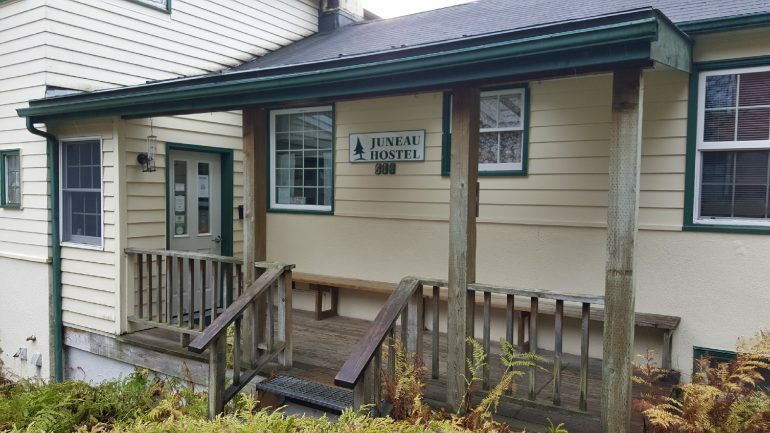 The Juneau Hostel features the standard communal hostel set up with common bathrooms. You cannot beat the prices. It is a popular destination for adventurers and you would be wise to get reservations in advance. Please note that your stay will be limited to a maximum of 5 days. Along with the low cost and shared living spaces, travels must abide by strict hostel rules as well as a curfew. After curfew guests can leave but cannot come back in until morning. Be sure to check out the rules before booking. I can attest as a local neighbor that the hostel is very well maintained and is clean and quiet. This is a great inexpensive alternative for the traveler on a budget. On the other hand there is no privacy and you are expected to do a chore in the house. This may not be everyone’s idea of a vacation. You can find their website here Juneau Hostel.